Hi everyone, welcome to the 2018-2019 school year. I’m attaching our back to school letter explaining when our back to school in-service days will be held this year. Please disregard the 1st draft of this letter that was mailed out. The 2nd mailing has the correct dates/times. 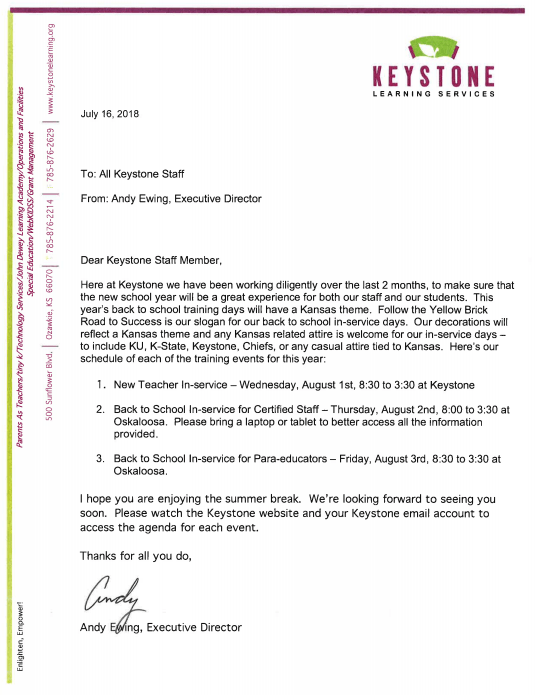 New teacher training will be held Wednesday, August 1st here at Keystone, Back to School Inservice for professional staff will be held Thursday, August 2nd, at Oskaloosa. Back to School Inservice for para-educators will be held on Friday, August 3rd, also at Oskaloosa. Each event is scheduled to start at 8:00 with coffee and donuts served from 8:00 to 8:30. I’ll be looking forward to seeing you then.